Our Trip to Dubai !! Flight experience and service on board Emirates Airlines was good. 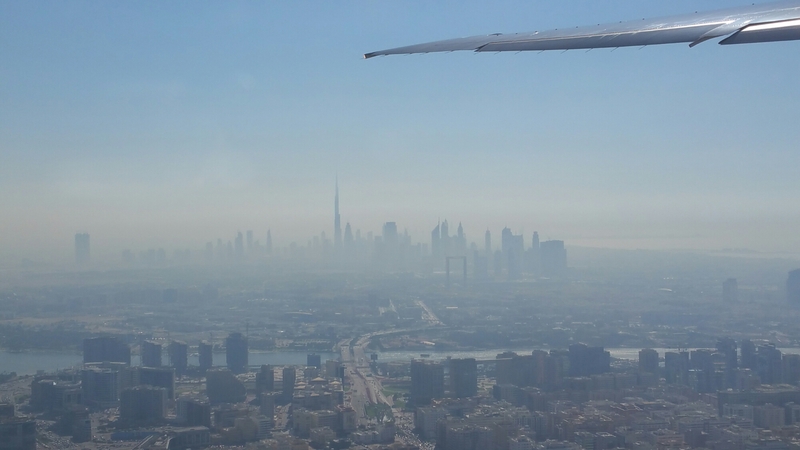 A 3 hour 15 min flight from Hyderabad , India.We landed in Dubai at 12.15pm. Dubai airport is huuge. We picked our baggage and looked for Etisalat and Du counters. Found Etisalat and got a prepaid card within a few minutes. Was surprised to see women drivers at the taxi stand. Our driver was a Filipino. On the way to our hotel we got a glimpse of sky scrapers and Burj khalifa too. Was surprised to see a lot of flower beds by the roadside .I didnt expect to find any in the desert.Apparently they have installed drip irrigation. Reached our hotel by 3pm and the receptionist delighted us by upgrading our room to an Executive suite and we guessed the reason was because we had booked well in advance and paid the full amount. 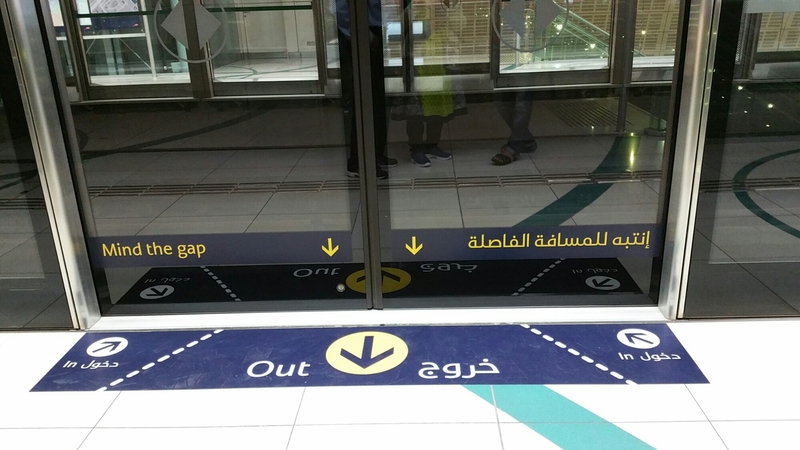 I liked the discipline with which people got in and out of the train.Dubai metro is the longest driverless metro in the world. We exited at the next station adjacent to the mall and just when we were wondering about how we should cross the road we found that there was a sky-way from the station leading directly into the mall. The Mall was huge. 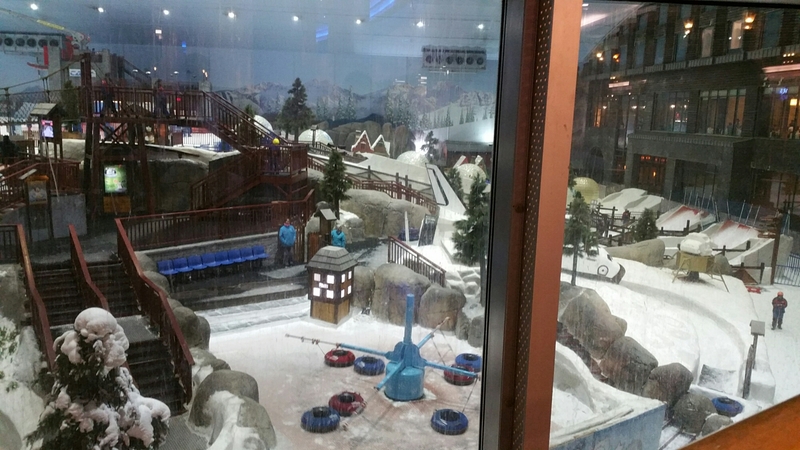 We hadnt planned on visiting SkiDubai which is adjacent/part of the mall of Emirates as the three of us (hubby, son and I) are allergic to cold weather and prefer to avoid . I felt bad that we would be missing one of the longest indoor snow worlds . We reached one end of the mall and spotted a lot of people watching something. We got curious and went closer and what we see is the ski dubai through a glass partition. 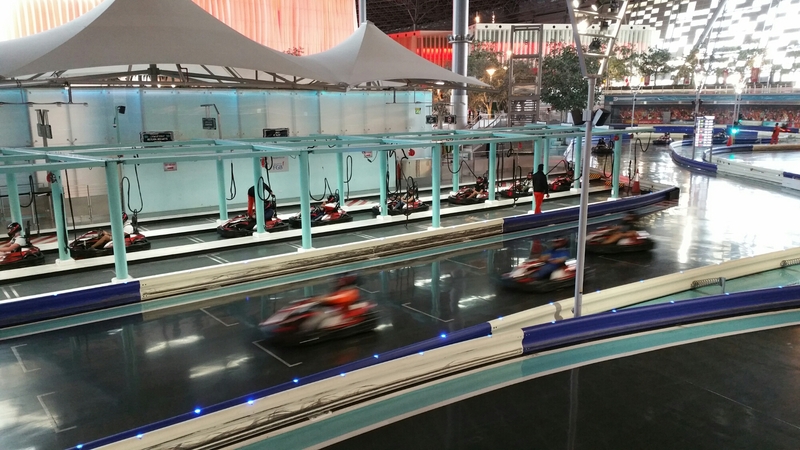 We were glad that we got a glimpse of this huge indoor ski world without actually going inside. We were hungry and looked for food stalls in the mall. We settled down at an Indian restaurant and were surprised to see a lot of non Indians at this restaurant. Appears Indian food is a favorite of a lot of non Indians . The food was very good. Had an excellent continental buffet breakfast and headed to ‘The lost chambers’ on Jumeirah palm. Was stupefied seeing the artificial island and the kind of construction on it. We learnt that people prefer to live closer to the sea as it is cooler and hence a lot of demand for residences on the palm.Lakhs of people live on the island. Our taxi driver suggested that we take a ride on the mono rail which goes from the Base of the palm to the tip and back. We were not aware of the mono rail. We went by road to the tip of the palm where the monorail starts . We got a good glimpse of the artificial island and its fronds with villas on either side and each villa having its own beach. The ride on the monorail is a must to get a glimpse of the fronds. Went up and down the palm ,on the monorail ,which is 5km from the Base to the tip. The Lost chambers is attached to The Atlantis hotel which is at the tip of the palm. This is an aquarium which is themed as a city that is lost under water. Always nice to spend some time with species living in water. Went to Saravana Bhavan restaurant in Al Barsha for lunch. The variety of dishes in the South IndianThali was similar to any south indian restaurant in India and tasted authentic too. All the veggies must surely be imported.There are several Saravana Bhavan restaurants all over Dubai. 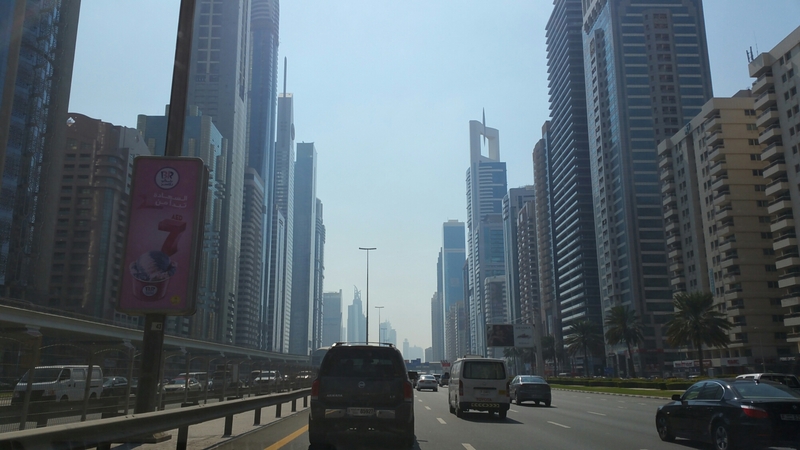 Got back to our room and relaxed for a while before we headed towards Dubai Mall. Entrance to Burj Khalifa is from inside the mall. We had booked tickets to Burj Khalifa in advance for the most preferred slot from 5 to 6pm. We reached on time and were ushered inside. After winding through a long passage with exhibits, visuals , arabian music and models of the Burj we reached the lift. We reached 125th floor in less than one and half minutes after a smooth vertical ride. Felt nice to be At The Top of the highest man made structure. Great 360 degree views of the ocean and the desert . We were allowed to stay beyond our time limit.There was no compulsion to leave. It rained while we were At The Top. We bought a few souvenirs too. Got down the Burj and spent sometime in the Mall. As expected we did get lost several times and had to look/ask for directions.There are interactive maps at a few places. More such maps should be placed all over the place.The Mall is like a mini city . Never ending stores. 1200 stores !! 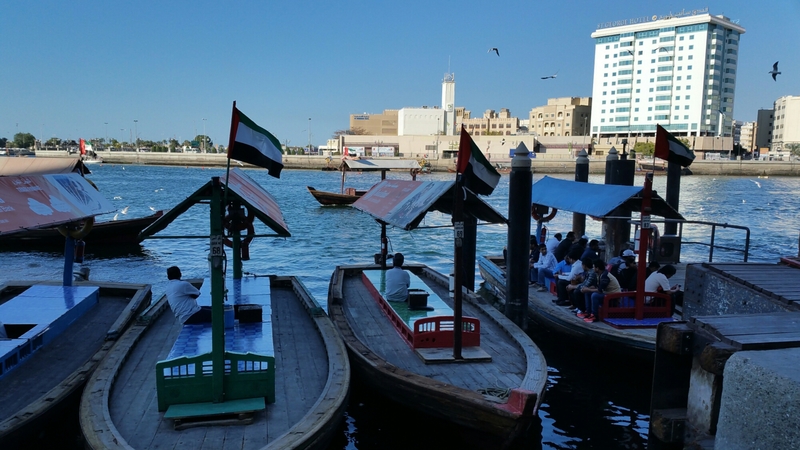 We planned a local tour in the forenoon and Dhow Cruise in the evening. 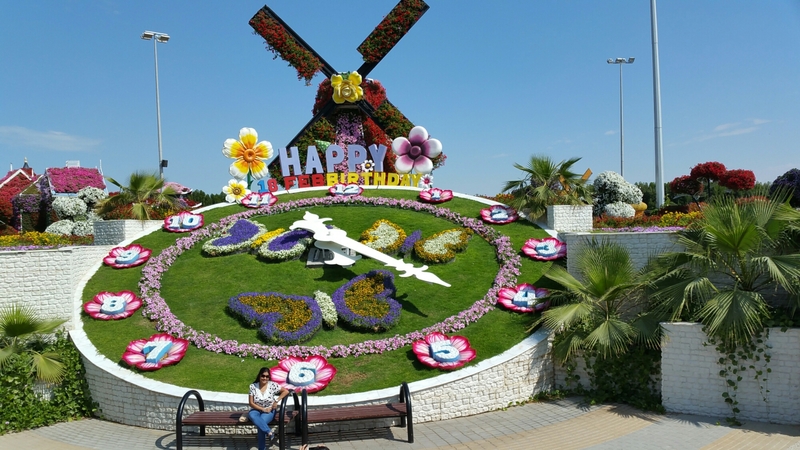 We hadn’t planned on visiting ‘Miracle garden’ but our driver insisted that we see it. The whole place is decorated with flowers. A lot of small pots with a variety of flowers are placed in various shapes.Mostly Petunias, chrysanthemum and geranium. 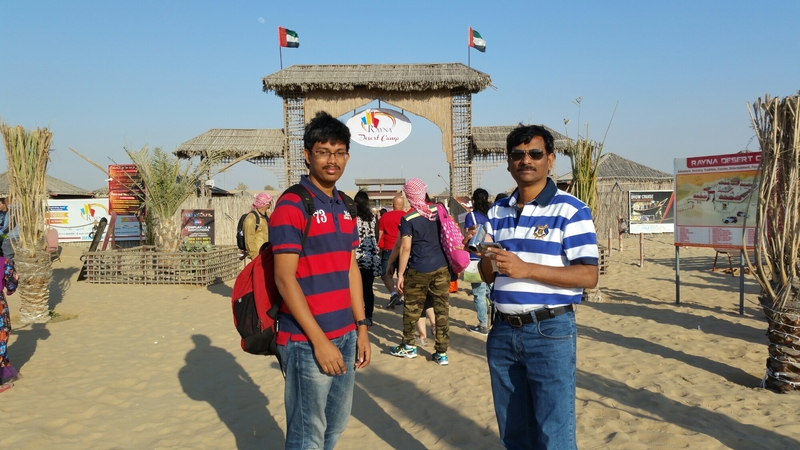 We then went to Jumeirah beach. Time to wet our feet in the sea and get a closer view of Burj Al Arab. 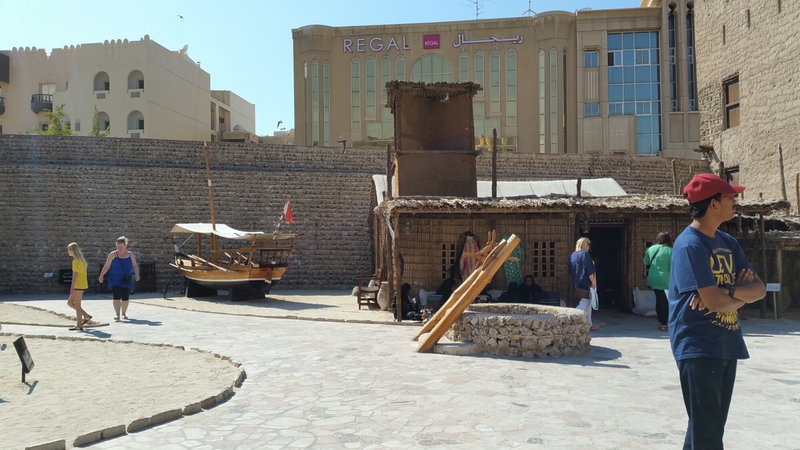 We then went to Dubai Museum. Appears very small from the outside but they do have a nice collection in the underground floor too.Old boats, knifes and implements,lifestyle of the people in the past using wax like models, archaeological finds etc. There was a short film on how Dubai grew from a small trading town which was famous for pearling to the current city with the tallest biggest fastest stuff in the world. Time for lunch and we decided to go to another Saravana Bhavan restaurant ,which is adjacent to the creek and close to Gold Souk which was next destination as per our schedule. Had Masala Dosa which was yummy. 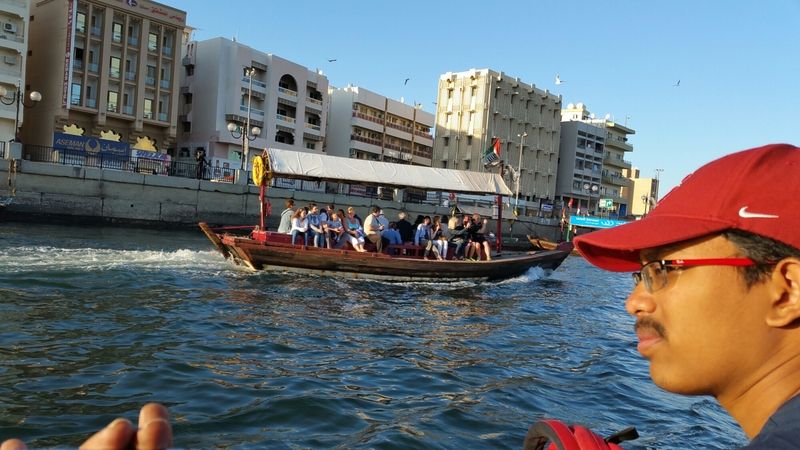 Took a ride on the Abra boat for one Dirham per person to the opposite side of the creek where the Gold souk and Spice souk are located. It was a 5 minute ride. Spent some time in the small lanes of Gold souk watching all the gold chains hanging down from the displays. There was more of diamond jewellery. I bought cinnamon in the Spice souk as I drink a decoction of ginger and cinnamon first thing in the morning. It smelt good. We went back to our hotel all the way back to Al Barsha. 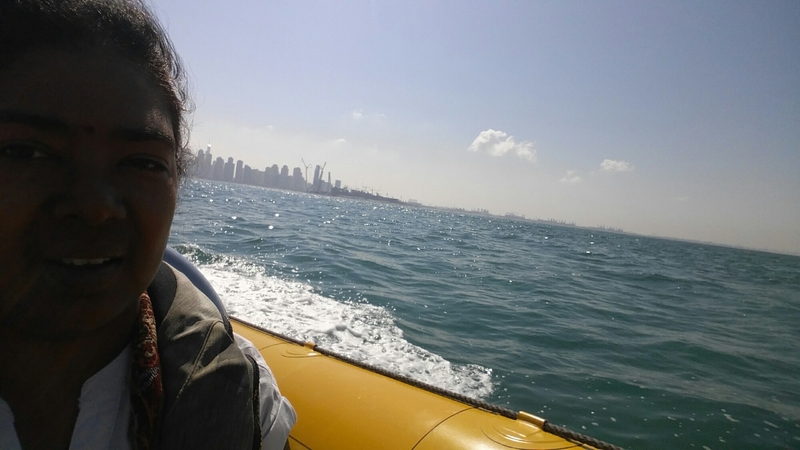 Relaxed a bit , freshened up and drove back to Diera creek just in time for the Dhow cruise which starts at 8pm. 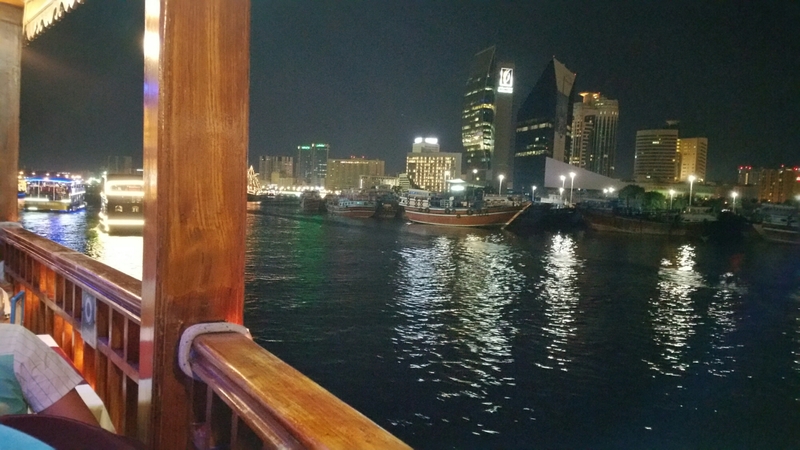 That’s the view of another Dhow boat (a wooden boat) from our boat. We had booked Rikka cruise which is opposite to Radisson . There was a Tanoura dance performance after dinner. It is a 2 hour trip up and down Diera creek. Everyone is seated at their tables. There are two floors and one can choose to sit on either of the floors if you come in early.There were almost 80 people on each floor.Dinner buffet was good. Got back to the hotel by 10.30pm. A one hour quick trip should be good enough. Enjoyed continental buffet at our hotel. The buffet spread is excellent. Reached ‘The yellow boats’ starting point near Spinneys on Marina Bay. 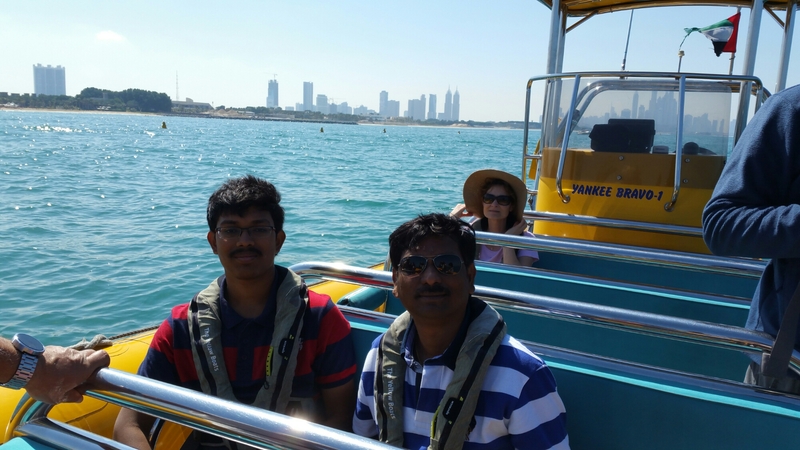 A one and half trip on a speed boat starting in the Marina Bay which goes around Jumeirah Palm, gets close to the Atlantis, Burj Al Arab and then back to Marina Bay. Got back to our Hotel , had lunch at the Thai restaurant and got ready for the Desert Safari. We booked on Rayna Tours and their vehicle arrived at 3pm to our hotel. We picked up 3 more tourists on the way. Once we got away from the city we got to see the real desert and the dunes . We saw a few vehicles doing the dune bashing thing. The vehicles go up and down the dunes and people seem to enjoy.The driver stopped after a while and asked us to get off and get in another vehicle which would take us inside the desert. This was a land cruiser and the ride to the Desert camp was half as bumpy as Dune bashing. 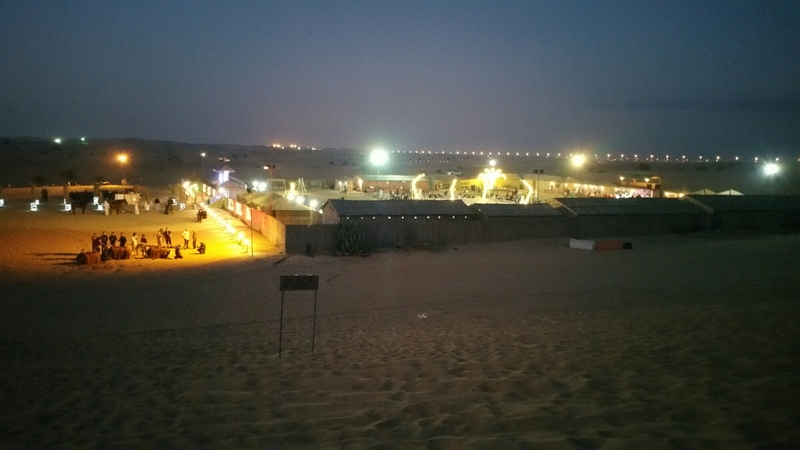 The camp was quite spacious with camels rides , mehendi , a few shops selling local artifacts, photo session wearing Arabian dress and a falcon . Quad bikes are available for rent. Tea/coffee was unlimited. Buffet dinner was good . There was a Tanoura dance, followed by Fire dance , followed by Belly dancing. A nice evening in the desert.We go back to our room by 10pm. 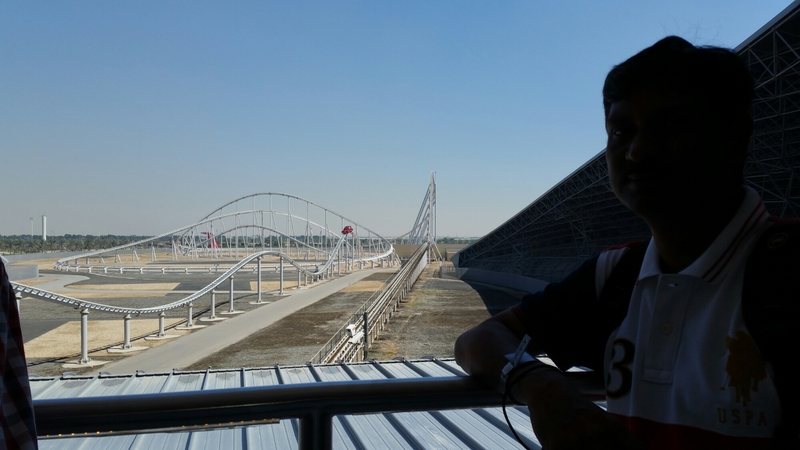 Started for Abu Dhabi by 9.30am to spend the day at Ferrari World. Reached Abu Dhabi by 10.45am . Entrance to Ferrari world is through Yas world (a Mall ) . We had taken a ‘3 fast pass ticket’ as it was a weekend and we expected crowds and queues. It was not as crowded as I had expected.The fast pass is definitely useful if one comes in a bit late in the day. My son enjoyed going on the Ferrari Rossa two times and was ready to go a third time. Supposed to be the fastest coaster. 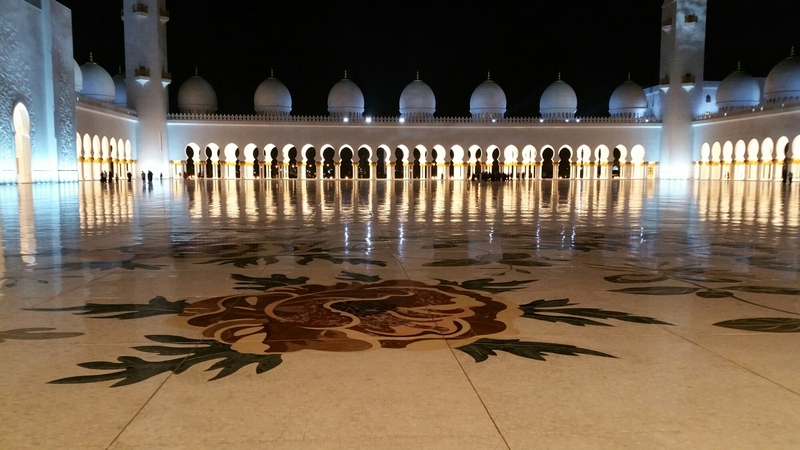 Our driver advised that we visit Sheikh Zayed Grand mosque in the evening. He was right. 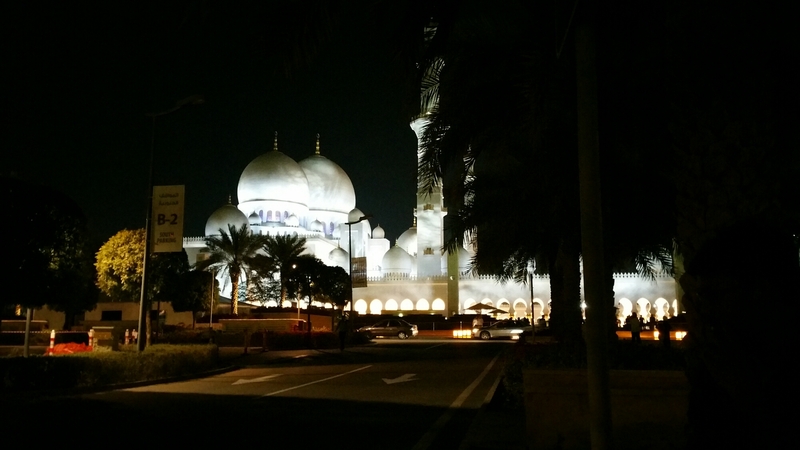 The mosque did appear ethereal and glowed with all the lighting. Made completely with marble . The interiors are beautifully designed. 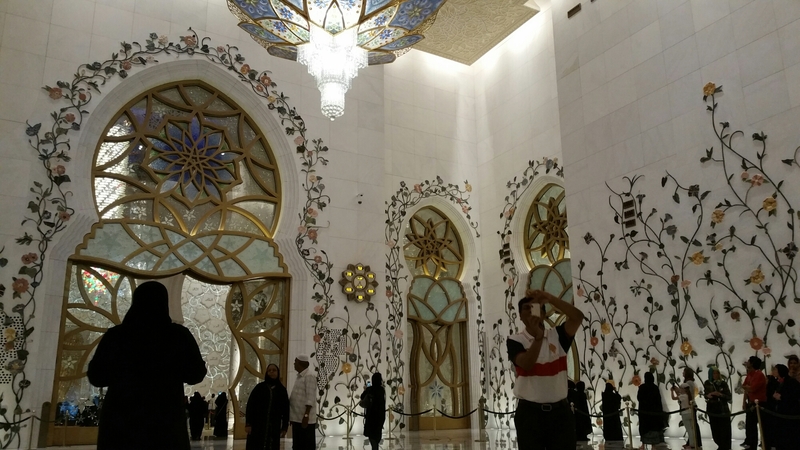 There are flower and leaf motifs made with colorful marble.The marble inlays on the floor, pillars and roof of the domes are very pretty too. The doors and windows had beautiful designs etched in glass. The place is serene . All women are expected to wear full sleeves and fully covered clothing while entering the mosque. A scarf or shawl will help in covering the head too. I usually carried a shawl wherever i went and was wearing full sleeves and fully covered so i didn’t have to wear the traditional Arabian dress given to others before entering the mosque. On our way back to Dubai from Abu Dhabi we visited Ibn Battuta Mall. This is another huge mall . We bought some gifts for family. Time to pack up and fly back to Hyderabad, India. All the gifts/souvenirs/chocolates for our families and friends were neatly packed . We didn’t have time to visit the terrace of our hotel which is on Sheikh zayed road. We would reach our hotel very late everyday and were too tired by end of the day 🙂 .After packing we decided to go the terrace . There was a cute lil swimming pool and a nice bar too. 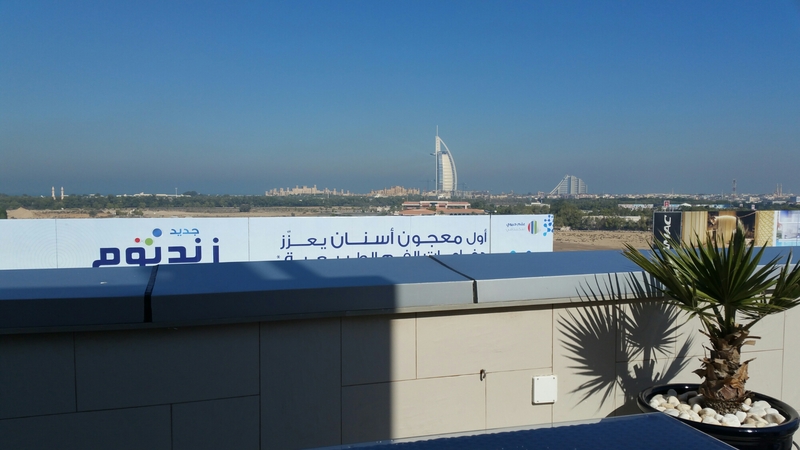 Nice view of Jumeirah palm , Burj Al Arab and Burj Khalifa from the terrace of Holiday Inn , Al Barsha. Open WiFi connection is available at most public places. We hired a taxi for most of the days except on the first and last day. It is quite easy to book a taxi by phone . We didnt try the mobile app of the state run taxi service. Food is quite hygienically prepared and we learnt that the food inspectors do a good job. I didnt have to worry about eating out. I did take some snacks from home and bought fruits at the nearby supermarket but there is no need to worry about food at all. Categories: travel | Tags: Abra Boat, Al Barsha, at the top, Burj Khalifa, desert safari, Dubai, Dubai mall, Ferrari world, Formula Rossa, Gold Souk, Holiday inn, Jumeirah beach, jumeirah palm, Lost chambers, marina bay, Mono rail, rayna tours, rikka cruise, saravana bhavan, saravanaa bhavan, sheikh zayed grand mosque, ski dubai, Spice Souk, tanoura dance, The yellow boats, tourism, yellow boat tour | Permalink.